This year, Edge@DLD is presenting a session with three of the original members of Edge who year in and year out provide the core sounding board for the ideas and information we present to the public. I refer to them in private correspondance as "The Council"). Every year, beginning late summer, I consult with Stewart Brand, Kevin Kelly, and George Dyson, and together we create the Edge Annual Question which Edge has been asking for the past fourteen years. Stewart Brand is the founder and editor of Whole Earth Catalog and author of Whole Earth Discipline; Kevin Kelly helped to launch Wired in 1993 and is the author of Out of Control and What Technology Wants; and George Dyson, a science historian, is the author of Darwin Among the Machines and the forthcoming Turing's Cathedral. This is fourth year that Edge has been invited to collaborate with DLD (Digitlal-Life-Day) in Munich. In 2008 genomics researcher the Edge Conversation featured J. Craig Venter and biologist Richard Dawkins on "Life: A Gene-Centric View". In 2009, psychologist and Nobel Laureate Daniel Kahneman and philosophical essayist & researcher Nassim Nicholas Taleb held forth on "Reflections On A Crisis." In 2010 the conversation included computer scientist David Gelernter, Feuilleton Editor (Sueddeutsche Zeitung) Andrian Kreye, and Feuilleton Editor & Co-Publisher (Frankfurter Allgemeine Zeitung) Frank Schirrmacher, who explored the idea of "The Informavore". (See below). You might want to just delve into the site edge.org later on to grasp how wide a range of topics and the wide the types of writers are there. Every year — and it's just out now — is a great feature in which John asks one deceivingly simple question. For example, "What are you Optimistic About?" And because there's a network of thousands of really brilliant minds, the answers are mind-boggling. This year's question was "What Scientific Concept Would Improve Everybody's Cognitive Toolkit"? It's worth checking out. It's really wild. ANDRIAN KREYE was born and lives in Munich. Since 2007 Andrian Kreye works as editor of the Feuilleton at the Sueddeutsche Zeitung. From 1988 to 2006 he lived in New York, working as a correspondent for Sueddeutsche Zeitung, Frankfurter Allgemeine Magazin and Tempo. During that time he also worked extensively in Latin America, Africa, Asia and the Middle East. In 1986 he was part of the founding team of the magazine Tempo. He has published four books about America, written, produced numerous TV documentaries. [ANDRIAN KREYE:] I have the great honor and pleasure of introducing Edge to you. Edge was basically what we from the cultural side were always waiting for on the Internet. It was basically an intellectual salon and what happened — and what we all were hoping for — was the intellectual salon became a global network of thought. And in about two minutes you are going to see the core group of Edge, led by John Brockman which is going to be led by John Brockman. John Brockman started the website edge.org in 1997 as a digital outpost of the Reality club, which was something like a mobile round table of science’s most brilliant thinkers and visionaries. The third culture is just staring to get it's major thrust and Edge is still a major force of this thrust. Well it's always great to rave about John, but we'll let Denis Dutton do it. Denis Dutton, who recently passed away, was editor of another intellectual outpost on the Web, Arts & Letters Daily. In the last email John received from him, Dutton called him "the greatest intellectual impresario in publishing in the world. In fact, there is not even any magazine editor who can compare with you in the current generation." You might want to just delve into the site edge.org later on to grasp the wide range of topics and types of writers. Every year — and it's just out now — is a great feature in which John asks one deceivingly simple question. For example, "What are you Optimistic About?" And because there's a network of thousands of really brilliant minds, the answers are mind-boggling. This year's question was "What Scientific Concept Would Improve Everybody's Cognitive Toolkit"? It's worth checking out. It's really wild. And he also has a great device called "the book". When The Annual Question comes out, the Question from the previous year also comes out in book form. I talked to Martin Rowan last night, the editor-in-chief of Wired.UK Magazine, and he's in this year's Question ( and I was in this year's and last year's ... the excitement makes me feel like a teenager). Rowan said that if you are invited to answer the Edge Annual Question, it makes you feel like an intern again. I wish I could tell you that this is a really historic meeting because you are going to have the four core people from Edge here on stage. But it isn't because they've known each other for quite a while. In fact, this movement actually started in 1965 when the composer John Cage handed a copy of Norbert Wiener’s Cybernetics to John, and John and Stewart started underlining the book together in a frantic reading session that lasted two days. This is where it started and I welcome you to hear and see where it is today. All of you are here because of something Stewart Brand said to Steve Woznik in 1984 in a very offhanded way. We were at the first Hacker's Conference, at an old Army base by the sea in Marin County. Stewart organized it with the help of Kevin Kelly, a co-organizer. And he got me to pay for half of it. All the original hackers were there. I forget what Wozniak said, but I remember Stewart's reply ... I was sitting right next to him. JOHN BROCKMAN is a cultural impresario, whose career has encompassed the avant-garde art world, science, books, software, and the Internet. He is publisher and editor Edge.org, the highly acclaimed website devoted to discussions of cutting edge science by many of the world's brilliant thinkers, the leaders of what he has termed "the third culture", and CEO of Brockman, Inc. the leading international literary agency for serious nonfiction authors such as Richard Dawkins, Daniel Dennett, Jared Diamond, Brian Greene, Steven Pinker, and Nassim Taleb. He has the distinction of being the only person to profiled on Page One of both The New York Sunday Times "Arts & Leisure" and The New York Times "Science Times". Included in his works as author and/or editor are By the Late John Brockman; The Third Culture; Digerati; and The New Humanists. In addition, he is editor of a series of books based on the Edge Annual Question that include What We Believe but Cannot Prove; What is Your Dangerous Idea? ; and Is The Internet Changing the Way You Think? [JOHN BROCKMAN:] All of you are here because of something Stewart Brand said to Steve Woznik in 1984 in a very offhanded way. We were at the first Hacker's Conference, at an old Army base by the sea in Marin County. Stewart organized it with the help of Kevin Kelly, a co-organizer. And he got me to pay for half of it. All the original hackers were there. I forget what Wozniak said, but I remember Stewart's reply ... I was sitting right next to him. "On the one hand, information wants to be expensive because it's so valuable. The right information in the right place just changes your life. On the other hand, information wants to be free, because the cost of getting it out is lower and lower all the time. So you have these two things fighting against each other." That remark was picked up by Kevin Kelly in the CoEvloution Quarterly, published in 1985. And somehow, all of you forgot half of it, and information wants to be free became a mantra, it became an ideology, for some it's a religion, for others it's a cashbox for stock or speaker fees. But I've always been wondering about the tension of the two fighting against each other and what happened to one half of the fight? All of you know enough about Stewart. I will just ask him to begin, and in any event, he's not even going to talk on this subject. His most recent book is Whole Earth Discipline: Why Density's Nuclear Power, Transgenic Crops, Restored Wildlands and Geoengineering Are Necessary. What we do at Edge meetings is to encourage our participants to ask each other the questions they are asking themselves. Stewart is not here to talk about his book, which he was questioning himself about four years ago. He's on to new things. We are now in an era called the Anthropocene. An era in which humans are running way too much of the atmosphere and everything else badly. We are in the situation were we don't have a choice of stopping terraforming. We only have the choice of terraforming well. And that's the green project for this century. STEWART BRAND is co-founder of Global Business Network and president of The Long Now Foundation. He created and edited the Whole Earth Catalog (National Book Award), and co-founded the Hackers Conference and The WELL. 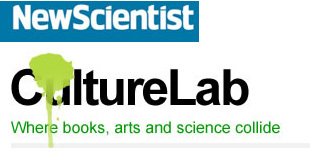 His books include The Clock of the Long Now; How Buildings Learn; and The Media Lab. His new book, is titled Whole Earth Discipline: Why Dense Cities, Nuclear Power, Transgenic Crops, Restored Wildlands, and Geoengineering Are Necessary. He graduated in Biology from Stanford and served as an Army Infantry officer. [STEWART BRAND:] I'm an environmentalist. I've been an environmentalist since I was 10. That was 60 years ago. And, it's tough being an environmentalist now. Because things have switched around. Because this is what's happening. With climate change, we're looking at a situation where us environmentalists, instead of protecting natural systems from civilization, we're now trying to protect civilization from a natural system, which is climate responding to our apparently excess greenhouse gases. And if they go ahead as we are today, then we won't get a stable climate until maybe five degrees Celsius warmer, which is exactly what it was 55 million years ago, in the Eocene-Paleocene Thermal Maximum. There's no rainforests in that world. There's carrying(?) capacity for maybe 1.5 billion of us in that world, and it would be tough getting from the seven billion we have now to the 1.5 billion. What we want is, somehow, to keep the civilization-friendly climate we've had for the last 10,000 years going for another 10,000 years. That would be nice. And then we'd get to keep having a civilization. So, in light of that, some different things are green than they used to be, back when the modern environmental movement took shape in the 1970s. Some of our ideas and methods from then don't really apply now. We used to hate cities, but we're now realizing that cities are green, and they're green for one of the reasons that we got worried about early on, was the whole question of what happens with the human population increasing? Well, the thing that happened with the cities ... as we are urbanizing now, which everybody is very rapidly, is the rural populations are dropping off, and we are also going to get to the place where the city populations also level off and drop. So, we'll get to a point where population will basically get to eight or nine billion, level off, and then head downward precipitously by the second half of this century. The reason is that cities are population sinks. And as we get to 80 percent of population of the world living in cities, we get into this negative, below level-keeping birthrate, and then carry right on down. Kevin Kelly is pretty persuaded that, by the second half of this century, we will have a population crisis. But it'll be like the one that is in Japan and Russian, some in Germany, of not enough children happening. So, what's really going on is the Big Event ... and Geoffrey West has been tracking on this ... is that, with 1.3 million new people in cities every week, 70 million a year, that goes on decade after decade, it is changing the world, demographically and economically. Because the villages of the world are emptying out. That's good news ecologically, because then the natural systems there grow back very rapidly, especially in the tropics. Where people are going is where the action is. Mostly squatter cities, slums. A billion people in slums now. Another billion are expected in the next few decades. And instead of being squashed by poverty, in these places, people are busy as hell getting out of poverty just as fast as they can. They are basically entrepreneurs. They create jobs if they don't exist. They operate of the informal economy. And they create their own homes, their own towns, their own economies, bit by bit. That's where all the adaptation is in the world today. Demographers are saying, city planners are saying, that basically squatters are the major builders of cities in the world these days. That's economic good news for the people there. They are getting out of poverty, gradually. They're bringing their countries out of poverty, as in India. And, they are moving toward the energy patterns of developed cities that we have here. So places like Darby, in Mumbai, soon enough are going to look like downtown London. Everybody in the global south is tired of being sweaty all the time. They are going to get air conditioners. So they need grid electricity, baseload electricity, electricity that is always on. Cities are 24/7. If you're going to light up at night, and keep warm in the winter, like here, and cool in the summer, you're going to need a lot of electricity. So far, the only clean forms of electricity come from hydro and nuclear, that feed into baseload. Because as yet, we don't have storage for wind and solar, and you're starting to see green on green fights between environmentalists over things like wind, who are saying, it's all very well to get that nice, clean energy, and it is, but it uses up a lot of terrain. Basically 250 square miles for one gigawatt of electricity. And, here in Europe, you're starting to get experience with wind, and realize that it takes a lot of subsidies to keep it going. So you're starting to see political cartoons like this from Britain. Same thing with solar. In California, a whole lot of people want to put a lot of solar, quite rightly, in the Mojave Desert. Well, the Mojave Desert is a green desert. And, when you bulldoze it for solar farms, it gets pretty rough. Bill Gates makes a nice distinction between energy farms, using very dilute sources of energy, like wind, biofuels and solar, and energy factories that are very concentrated, like coal, gas and nuclear. To a certain extent, those concentrated factories are greener than the things that are big and wide and using up too much space. I had to change my mind about nuclear, by climate forcing me to rethink what's really green, in terms of greenhouse gases. And the thing that an environmentalist wants to do is compare the waste streams. So, the waste stream of ... what do you got, coal are doing 40 percent of the world's electricity, nuclear about 16 percent. But look at what happens with the coal waste, and the electrical waste from nuclear. If all of your electricity came from nuclear, it would be about one Coke can's worth of waste. But, one gigawatt a day from a coal-fired plant is turning 8,000 tons of fuel into 19,000 tons of carbon dioxide, plus all the slurry and mercury and all the rest of it. That's where you get to a situation where, basically, the waste, compared to nuclear, where you've got 20 tons of fuel in a gigawatt year turning into 20 tons of waste, which is easy to store. You have 2.9 million tons of coal converting into 8 million tons of carbon dioxide a year. And where that goes is into everybody's atmosphere, instead of into nice, dry cache storage, where you can keep an eye on it. So, the lifetime emissions of a kilowatt are, for these various energy sources, nuclear's down there with hydro and wind, and ahead of solar. Environmentalists are always worried about nuclear waste. How are we going to bury it? Well, as it happens, in the United States, we've been keeping it like you probably do here, in dry cache storage out in back of the parking lot, and it's okay there. We also have been putting it, for 10 years now, into a thing called the WIPP, the Waste Isolation Pilot Plant in New Mexico, down half a mile in a salt formation. And that salt formation is 250 miles in circumference. It has been there for 250 million years. It's not going anywhere. Water doesn't get in or out of it. It doesn't matter what you put the waste in. The salt heels in around it and encases it. So, the nuclear waste problem that I thought was insoluble has actually been solved long ago. It's not a major issue. From the technology standpoint, which this group should be interested in, the usual reactor these days, like from Areva or Westinghouse, is 1.6 gigawatts. But there are starting to be these small modular reactors that are down around 25 megawatts, and a fraction of that. They're built in factories instead of on-site. They're inexpensive. You stick them in the ground, and that's the containment vessel. And they're being built rapidly. Russians already have some barge-based ones they're going to use up along the Northern Sea route, where the ice is melting. There's an outfit in New Mexico called Hyperion ... this came out of Los Alamos Labs, their design. And then, Oregon has one called New Scale. These things are all modulars. The idea is, you can get one, run part of the electricity with it in your time, build on another and another and another. They're pretty much plug and play. The makers of all of the nuclear reactors the Navy uses in the U.S., Babcock and Wilcox has one they've just come out with. It's starting to be ordered in the United States. The Tennessee Valley Authority. There's even a small fourth generation reactor, an integral fast reactor that not only burns nuclear waste, but these things run hot enough to desalinate water and generate hydrogen. There's various thorium reactor designs coming along. India's very interested in that, because they have a lot of thorium. This design, from Intellectual Ventures, is meant to be put in place, run for 60 years, and then just left there. It is its own varial wall. Bill Gates has just come out very strongly for nuclear, and he's helping support design experiments with a new complete approach called Wave Reactor. It's nice to have some new ones coming along. We've always said that fusion would be swell, but it's a long time in the future. But actually, I've discovered that, at the Lawrence Livermore Lab in California, they're a few months away from getting ignition of a laser inertial fusion ignition. If they get that, then they're maybe 10 years away from an actual one gigawatt laser inertial fusion engine. That would change everything, because, environmentalists will step right up to this one, because you're looking at zero greenhouse gases, zero mining, zero waste stream, zero possibility of meltdown, and no possibility of it could be used for weapons. The issue with nuclear, it's kind of expensive. So is solar and wind and all these other things. The problem is that coal is expensive. And this is where governments come in. Basically, the governments of Europe, North America, China and India have to find a way to make coal expensive. And if they do that, then we have a shot. And if they don't, we're in very deep trouble. I especially am interested to see in Europe that GM is green, genetically modified crops. Turned out to be green. They didn't really get design for that. But, among the people who picked up on them, and Kevin Kelly reported this, is the Amish. The most technologically conservative farmers group in America love this, because, as many farmers have found, they are better seeds. And so, they use BT corn, and so does South Africa, where it's used for the very popular white maize. This is the most successful innovation in agricultural history, and it's taking off all over the world, except a few left-behind places. Environmentalists, for wrong reasons, took a stance against genetic engineering at the beginning. These things turned out to be green by accident, instead of by design. They can be a lot greener than they have, but we have stood in the way of golden rice in Asia, and we have stood in the way of Africa moving ahead with much better tropical crops, designed and made by engineering. The moral issue, according to the New Field Counsel on Bioethics, is that there is a moral obligation to make GM technology available to everybody, especially in the developing world, that wants it. One of the reasons is that we first had things that are good for farmers. Now we're getting things coming that are good for consumers, for the people who eat these engineered foods. So, cassava, which is a staple for 800 million people, is actually a dreadful food. All it is is starch. But there's a version of it coming along that has everything you would want in it, including less cyanide, which is one of the aspects of that food. The things I've marked with a red dot here are all foods that we're going to want, such as peanuts that are not allergy-causing, soy that would not be allergy-causing, soy that has omega-3 fatty acids. That's already coming. And so it goes. Basically, we're moving from the rather slow pace of recombinant DNA to a much more rapid pace now, what's called synthetic biology is coming directly to children, much as computers have done. And you're seeing, every year now, the IGM meeting in Massachusetts. These biotech hackers are getting together from 26 countries to race their hot-rodded microbes. Then we get to GM engineering. GM engineering, at least the research is green. We don't know if we need it. But what we're realizing is that there's an artificial infrastructure of bridges and things like that, but the river under the bridge is infrastructure too. The artificial infrastructure is based on the natural infrastructure. The forest, and especially the atmosphere and the climate that goes with it. To keep this climate something stable like we recognize, now that we know there's lots of instabilities in this highly nonlinear, complex system, we are stepping up to the realizations that a lot of things are going to frighten us into, in the next decade, taking GM engineering seriously. We need to do the research now, and that's what we're moving up on, because we realize that it can be very cheap. It was free in 1991, when Mount Pinatubo blew and cooled the whole planet off by half a degree Celsius. Here's a version of doing an artificial volcano every year, from the group in Seattle. And, for a couple hundred thousand a year, putting up sulfur dioxide in the stratosphere, at a rather small quantity, can keep the planet cooler by three degrees Celsius as we increase things. We are now in an era called the Anthropocene, an era in which humans are running way too much of the atmosphere and everything else badly. We're in this situation where we don't have a choice of stopping terraforming. We only have a choice of terraforming well. That's the green project for this century. [JOHN BROCKMAN:] Stewart Brand ... For the past 45 years, for my money, the most influential thinker in America. Kevin Kelly is the big ideas guy at Wired. He was the founding editor of Wired in 1993. He's still connected to the magazine, as their advisor. And in terms of running Edge, when we do the Annual Question, we start in August by e-mailing each other. And it goes on and on and on, and typically, it's Kevin that comes up and cuts through the crap, and has the big idea. He's always exciting. There was an amazing discovery 50 years ago that the essence of life was not energy, that it was not carbon, but in fact information. And of course that's the essence of technology. So there is actually an equivalency between the world of the born and the world of the made, and it's actually not as far apart as we thought. KEVIN KELLY is Senior Maverick at Wired magazine. He co-founded Wired in 1993, and served as its Executive Editor from its inception until 1999. He is the author of the recently published book What Technology Wants. He is also editor and publisher of the Cool Tools website, which gets half a million unique visitors per month. From 1984-1990 Kelly was publisher and editor of the Whole Earth Review, a journal of unorthodox technical news. He co-founded the ongoing Hackers' Conference, and was involved with the launch of the WELL, a pioneering online service started in 1985. He authored the best-selling New Rules for the New Economy and the classic book on decentralized emergent systems, Out of Control. [KEVIN KELLY:] The world before Darwin was very curious, because the theory of biology was that it was just a collection of things. There was really no other organizing framework. It was just one thing after another. And actually, today, although we're all involved in making stuff, we don't actually have very good theory of technology. It's just basically one thing after another, just like it was before Darwin. I want to offer today a suggestion about a theory for technology, some framework that we could put it into so that we can understand what it means for us. And I want to start with the fact that we actually don't even know what technology is. Here's a common definition of technology: It is anything that was invented after you were born. Or else, it's this one: It's anything that doesn't work yet. But actually, it has to be more than those things, of course. It's everything in this room. It's the carpeting, it's the structures, it's the conduit. But more importantly, of course, it's the intangibles, like calendars and other laws, software. I actually think it's even more critical than that, which is that, if you take these two technological objects, the one on the left was something that anybody here could probably make. The one on the right is one that none of us here could make. In fact, all of us here together probably couldn't make it. But that's because the one on the right is actually composed of hundreds, if not thousands, of sub-technologies. Those sub-technologies require other technologies below, to compose it and to make it work. So actually, you might want to think of this object as more like a network. And as Geoffrey West shows, networks are what really make up everything that we make. If we look at networks, we can understand, in fact, this technology, the one in my clicker, the one that's running the computers here, that these technologies actually form one large network, maybe one ecosystem of technology, or maybe even a super-organism of technology. I'm interested in that super-organism. I give it a name called the Technium, to indicate that it's more than just culture, that in fact, it is something that has its own agenda, something that has its own response, its own agency. I talk about what technology "wants," to indicate that it has a leaning, a kind of a general urgency. And I use the word "want" provocatively. Here is a robot from Willow Garage. It's been programmed to find its own power by roaming through the hallways, looking for an outlet with its nine eyes. It takes its tail, and it plugs itself in to recharge. I stood between it and an outlet, and I could feel that it wanted electricity. It was not conscious. It was not deliberate. But there was an agency from that system. I use the same word to talk about what technology wants, what the system of the Technium wants. And I use the word "want" to mean the way in which a plant wants light, or a bacterium wants food. It's not intellectual. It's not conscious. It's a general trend in that direction. There's good news and bad news. The bad news is that this technology wants something of its own agenda. It's selfish. That's the bad news. The good news is that this technology has a moral dimension. It wants good stuff for us. There is a general, long-term, positive force for good in technology. I want to quickly give you a sense of where and how we can understand that. I suggest that the way we can ask what technology wants is by asking a different question, and that's based on the fact that there was an amazing discovery 50 years ago: that the essence of life was not energy and was not carbon, but in fact, it was information. And of course, that's the essence of technology. And so there is a kind of equivalency between the world of the born and the world of the made. The stuff that is living and the stuff that's made. It's actually not as far apart as we thought. We can import biological evolution into computers, and of course, we can engineer life. And so, these worlds are a lot closer than we think. That gives us permission to actually look at evolution and life for suggestions about understanding technology. So, what does evolution want? What are the long-term trends, the long-term agencies, in the evolutionary system? One we can understand and see easiest is increasing diversity over time in life, over 3.7 billion years. That's obvious to us. And actually, we can see that in the data. There's also another long-term trend, which is this movement towards complexity. Things start off simple, and they go to the complex. That is a long-term trend. It's not just an apparent thing, and it's not just a projection. We actually can show that there is a slight drift to things becoming more complex. It's very, very rare when complex things actually become simple. So, we intuitively feel that there's a long journey towards the more complex. I want to indicate that this trend is not suggesting that there's a ladder of evolution that we're kind of climbing up. I'm suggesting that, in fact, that it's a radiation outward. Every organism on earth today is equally evolved. There is an outward radiation. There's a direction, not a destiny. The other directions that evolution is moving towards is not just greater complexity and diversity, but also specialization. There's increased mutualism. Fifty percent of the species on earth are either parasitic or symbiotic. There's an direction towards increased sentience. Evolution, again and again, invents brains and minds. There's a movement towards evolvability. The entire process of evolution itself is evolving. The process by which things change are changing. So, those are some of the general trends in evolution over time. We see the same thing happening in the Technium. You can see the diversity of the made world. These are spark-catchers from 100 years ago, and they have the same kind of variety that, say, butterflies or beetles would have. That's one of the directions that technology is going. Another is increased specialization. The first camera was a general purpose camera or hammer. But over time, we make more specialized versions. We make a panoramic camera, an underwater camera. Then we make more specialized versions of those. We make the panoramic underwater camera. And then we make the panoramic underwater infrared camera. We keep making more specialized versions. You see the same thing in the Technium that we can see in life, so much that in fact we can almost map out the technological evolution as if it was a tree of life. The similarities are so great between the way the technological system evolves and the way the life evolves, that I suggest that we should think of the Technium as an extension of the six kingdoms of life. Those are the six kingdoms: plants, fungi, animal and three varieties of bacteria. We should imagine that the Technium is actually the seventh kingdom of life. It's actually been extended outward from the primates, and it behaves almost the same way. If that is so, then we can ask ourselves, well, what does the Technium, the seventh kingdom of life, want? The answer to a first approximation is that it's going in the same very general trends, the same general tendencies, as evolution. So, what technology wants is what life wants, basically, to a rough degree. What does that mean? Well, it means that every new invention that we invent also brings us new problems, maybe almost as many problems as we have solutions. I would suggest a couple consequences. One, most of the problems in the world today are technogenic. I would suggest that most of the problems in the world tomorrow are going to be caused by technologies that we have invented today. At first, that might suggest that there is just a 50/50 wash, that in fact, maybe technology's just neutral. But I actually think there's something else going on, and it's not the full story. The full story is that, when we invented that first hammer, we actually created a choice to use it for ill or for good that we didn't have before. We could use the hammer to kill someone or build a house. But that choice, which did not exist before, is itself good, even if we use something for bad. So, having the choice itself is a positive good. That positive good tilts the balance slightly in favor of the good, even by a little tiny bit. But it turns out, a little bit is all we need. Because even if we use technology to create only one percent more than we destroy a year, that one percent delta, that tiny little delta, is all we need, compounded over centuries, to make civilization. So a tiny, incremental delta, created by the fact that we're creating new choices with everything that we invent, including the choice to use it for harm. So that is what we get. That's what gives the long-term moral dimension to technology. If I had a bad idea, nobody here is going to suggest that I think less. Or that I stop thinking. The proper response to a bad idea is a better idea. Likewise, the proper response to bad technology is not less technology. It's not no technology. It's better technology. That's a very technocentric view. We always are increasing the options, and even when we have problems with the things that we've invented, the solution to these problem technologies is not to have less. The solution is: more and better. Including the problem that technology, at times, can be environmentally harmful. The proper response for that is not less technology. It's better technology, greener technology. So far as we've seen, to the best of our knowledge, we've not invented a technology that we could not invent an even greener version of. That means that, in a certain sense, the Technium is not inherently anti-life. If it is the seventh kingdom of life, it is inherently compatible with life. We've always been able to make things greener. So, what that means is that we're involved in trying to relocate technologies. We want to make a convivial form of them, to find the right job for them. DDT was a molecule that we invented and we sprayed it in millions of pounds, on millions of acres of agricultural lands, as a pesticide. That was a total environmental disaster. The same invention, the same molecule, relocated, and sprayed judiciously around households in the tropics, is the best eradicator of malaria, saving hundreds of millions of lives a year. We relocated that technology. Rather than ban it, saying "make less technology," we said, no, let's have a better idea. In the end what does technology want? It really wants one thing. We could collapse that long list of things that evolution wants and say that what technology really wants is increasing differences, diversity, options, choices, opportunities, possibilities, freedoms. That's what we get from technology. That's what it is bringing to us, everything that we invent. While we are at home or at work making new stuff, making new things, sometimes we feel, well, we may feel we're just kind of feeding consumerism, the capitalist machine that's driving all this stuff that we consume. And maybe it's ephemeral, or that we don't use it very long. We throw it out. And maybe, at times, we're seized with doubt about whether all this creation is worthwhile. It may be that we're not doing anything more than that at times, but in fact, we are. When we make new technology, we're actually increasing the possibilities and choices and differences in the world. The reason why that is good is because most of us need some kind of tool to help us find and express our genius. Mozart needed the technologies of the piano and the harpsichord to find and develop his musical genius. Or that could have been Beethoven. But imagine if Mozart had been born 2,000 years before the invention of the piano or the symphony. What a loss to us and to him that would have been. Or imagine if Van Gogh had been born 2,000 years before we had invented oil paints and canvas. What a loss to the world, and to him, that lack of technology would have been. Or, you know, what if we had not invented the technologies of cinema before, say, Hitchcock or Lucas had been born? What a hole in our culture that would have been. That means that, today, somewhere in the world, there is a boy or girl born, some Shakespeare of their generation, who is waiting for us to invent their technology, so that they can share their genius. So we have an obligation to actually increase the amount of technologies in the world. Just as we have benefited from those in the past who have invented stuff for us. What we want to do is to increase those possibilities in the world, More importantly, this action connects us to something even longer. There is a long-term trend in the universe of increasing self-organization. It began with the Big Bang, and self-organized galaxies, then with self-organized stars, which are furnaces to self-organized, heavier metals out of lighter atoms. And those heavier metals and atoms would self-organize into a planet, and maybe an atmosphere. And those, at least on our planet, self-organize into life, which self-organize into the mind in the Technium. That yields a kind of a long-term trend, beginning at the Big Bang, of increasing diversity, specialization, complexity. Which life is just extending. In fact, the cosmos, the bios and the technos are just one long string of this story. And the Technium is simply the most recent incarnation and acceleration of that long-term trend of the universe. So that when we make things, when we increase technological diversity and when we make and increase technology, we are re actually participating in something that comes way before us, and will run through and beyond us. We are involved in much more than just inventing novelty. We're actually involved in something that's bigger than ourselves, that can bring meaning to our lives. We're involved in increasing the possibilities, both for us, our children, and for the world at large and that is what technology wants. [JOHN BROCKMAN:] Thank you, Kevin. I just want to add that Kevin is the author of Out of Control and New Rules for New Economy, as well as the recently-published What Technology Wants. Also, it's interesting that he has no college or university degrees. George, who did not go to a college, dropped out of high school. And I made the waiting list at a college. Stewart's the educated person here. This is interesting, in terms of concerns about what's happening in America with regard to our educational system. David Gelertner, the great computer scientist, who is here today in the audience, talks about how science gets pushed out of the universities. But I don't know if the universities are the place where it happens. It's interesting. Our last speaker is George Dyson, author of Darwin Among the Machines; and Project Orion, a science historian among futurists. I met him when he lived 40 feet high in a redwood tree. He's come down, which is good for us. He spent the last seven years on a book entitled Turing's Cathedral which is his name for the Google campus. He's worked for seven years on what I consider the creation myth of the digital realm, starting with John (Inaudible) in Hungary, and leading to his talk at Mountain View on the 60th anniversary of John von Neumann's famous paper. George, the brother of Esther Dyson and the son of Freeman Dyson, is the smart one in the family. We are going back to analog. We are taking that cathode ray tube back the other way. If you look at what's exciting people here most, it's the things like Facebook and Google, and an awful lot of what is being done there is analog computing. GEORGE DYSON is a historian of technology whose interests have included the development (and redevelopment) of the Aleut kayak (Baidarka), the evolution of digital computing and telecommunications (Darwin Among the Machines), and the exploration of space (Project Orion). His forthcoming Turing's Cathedral is "a creation myth for the digital universe" that illuminates the transition from numbers that mean things to numbers that do things, precipitated by John von Neumann's bringing engineers into the den of the mathematicians, instead of mathematicians into a den of engineers. [GEORGE DYSON:] We're really all here because of Stewart Brand, and this was his 1972 Rolling Stone article, turned into a book. And the title of it was Fanatic Life and Symbolic Death Among the Computer Bums. And here we are. We're still here. Stewart's still hanging out among the computer bums. Stewart really helped make this industry, which was not an industry then. It was a hobby. He brought it to Rolling Stone and made it fashionable. That was a very important moment, and I urge everyone to re-read this. All the things we're still working on today were part of that original story. He went and visited the people who were setting up the first 20 nodes of the ARPANET, who were already using it for games. He talked to the people [at Xerox PARC] trying to build something called the Dynabook, which was a notebook computer, and way ahead of its time. Intergalactic Spacewar Olympics, Stanford Artificial Intelligence Laboratory, 1972 (Stewart Brand on far right, wearing wristwatch). Photo by Annie Liebovitz for Rolling Stone. I'm a historian, and in the history of computing, there's an Old Testament and there's a New Testament. And, in the Old Testament, the prophet was Leibniz, from here in Germany, who believed in this perfectly digital universe in which everything could be defined with binary code, and all truths would be discovered. And he went to the grave believing in that, and it looked really good for a long time. Leibniz supplied the logic. Leibniz's Digital Universe (design for a medallion presented by Gottfried Wilhelm Leibniz to Rudolph August, Duke of Brunswick, 2 January 1697). And the New Testament prophet was von Neumann, who built the machines that made Leibniz's dream come to life. And in between the Old Testament and the New Testament was Alan Turing, in 1936. The moment I'm going to go back to is exactly 60 years ago, in 1951. It was in 1946 that this group of von Neumann's started to try and build a computer, the machine whose randomly-accessible storage matrix became this digital world we live in. And in 1951, they finally got the thing running. From 1946 to 1951, those five years, they were working on this thing. I was last here at DLD in 2006, and now it's 2011. That's exactly the same span of time that those guys, against all odds — it was only a group of about six people — conceived and developed the technology, built this machine, got it running and de-bugged, and started solving serious problems. And in this whole similar amount of time, I've just been writing about it. It's very humiliating how much they got done. In 1951, they finally get the machine running. And this is an actual image of the digital universe when it came to life in 1951. 32 x 32 array of charged spots on face of Williams digital memory tube, ca. 1952. Photo courtesy of the Archives, Institute for Advanced Study. In the real universe, we can only imagine the origins, but here we can actually see it. It's a 32 x 32 bit array of charged spots, on the face of a cathode ray tube, that can be accessed by the control organ of the machine. In 24 microseconds, you can go to any spot [and read or write one bit]. And they had 40 of these tubes [in parallel]. Now, some people don't know what a cathode ray tube is. It's a glass tube, shaped exactly like this bottle. About the same size, but much thinner. And inside is a vacuum. There's nothing in there but electrons. And in this end is an electron gun that is producing a stream of electrons, and there's two coils that can aim the beam, on an X and a Y axis. At that moment in time, in 1951, this was an analog device. James Pomerene with digital memory tube made from an over-the-counter 5-inch analog oscilloscope tube, ca. 1952. Photo courtesy of the Archives, Institute for Advanced Study. And that was the origins of software, because they started writing codes that would use this memory. We switched from having numbers that represented things and meant things, for the first time, to codes that were numbers that could do things. And that was a profound transition that we're all still living in the repercussions of. It took five bits to specify a position on this axis, and five bits on that axis: a total of 10 bits to address one of these memory locations, and there were 40 of these tubes [collectively storing 40-bit strings, or "words."] So you put in 10 bits [specifying an address, and 10 bits specifying an instruction] and you got 40 bits out. That caused a chain reaction, just like the [2-for-1 fission in the] nuclear weapons they were trying to design. We went from analog to digital. And here is a list of the five different problems that they worked on, with an axis in time. The 5 main problems (left) addressed by the Institute for Advanced Study Electronic Computer Project, 1946-1958, with time scale for comparison. They worked on nuclear explosions, which were on a time scale of 10^-8 seconds. They worked on shock waves, which were fractions of seconds to seconds. And they worked on meteorology, which was in the middle: minutes to months to years. And they worked on biological evolution, over hundreds and thousands of years, and [they worked on] the evolution of stars and solar systems, up to 10^17 seconds. So, it's a time scale [ranging across] 25 orders of magnitude. And what's interesting is, if you look at this, what's exactly in the middle? The exact middle of that whole time scale is about two hours, which is the length of a Hollywood film. Somehow, in our perceivable universe, the time we take to tell a story is right in the middle. And that may just be an accident, or it may have something to do with what Kevin Kelly was talking about, how we [and our technologies] really are a product of this entire universe. That's how we got here. Now, from that perspective, where are we going next? Where is this whole digital world going? And I'm going to risk being thrown out of here by saying... not that digital is over, but that we've already moved into a new phase, that people just are not recognizing yet: back to analog. We're taking that cathode ray tube back the other way. If you look at what's exciting people here most, it's the things like Facebook and Google, search engines and so on. And an awful lot of what's being done there is actually analog computing. In the world of nature, in the world of brains, there's no digital code where a certain bit has a certain meaning. The computation is done in the analog way, where frequencies have meaning, and where how things connect — topology — has meaning. If you look at a search engine, that's exactly what's happening. It's counting the pulse frequency of connections between topological points. If you look at what Facebook does, if you took, say, a small high school and tried to write an algorithm that defined who was friends with whom, you would be completely lost very soon, because every day, somebody breaks up, and then somebody else's friend is not somebody's friend ... you could never keep track. And Facebook does this for 600 million people [in real time] and they did it by building an analog computer, by simply allowing all the people to connect with a very simple digital code. When you join Facebook, you download very little code. And then the whole system becomes its own analog computer, that maps the changes and the connections. Pulse frequency coding and template-based addressing is how biology stores [and conveys] information. You get the next molecule by saying you want the next molecule that more or less matches this template. And that's how search engines work. You can address [a memory location] without having to give a precise numerical address. Computers are now being used to program cells, and my parting thought would be that it's also the other way. That living cells have, for billions of years, been storing their genetic information outside the individual cell, in the viral cloud. Why do we all get colds? If colds were purely harmful, we would have stopped having colds millions of years ago. But we get colds because we need that input/output mechanism to convey genetic sequences through the viral cloud. That's an important interface. In many ways, life is using computers to further the agenda of cells as much as computers are using cells to further the agenda of technology. It's a symbiotic relationship. In a way, we're still living in the world of Leibniz. But it's definitely going somewhere else. And a lot happened in 1951. We went from zero kilobytes to the memory of this computer I talked about: five kilobytes. You used to be able to say that this was the memory of a desktop icon, but there's been icon bloat, so now it's the memory of your cursor, five kilobytes. And the year I was born, 1953, the total memory in the world was 53 kilobytes. How the Internet gets inside us. ...One of the things that John Brockman’s collection on the Internet and the mind illustrates is that when people struggle to describe the state that the Internet puts them in they arrive at a remarkably familiar picture of disassociation and fragmentation. Life was once whole, continuous, stable; now it is fragmented, multi-part, shimmering around us, unstable and impossible to fix. The world becomes Keats’s “waking dream,” as the writer Kevin Kelly puts it. The odd thing is that this complaint, though deeply felt by our contemporary Better-Nevers, is identical to Baudelaire’s perception about modern Paris in 1855, or Walter Benjamin’s about Berlin in 1930, or Marshall McLuhan’s in the face of three-channel television (and Canadian television, at that) in 1965. When department stores had Christmas windows with clockwork puppets, the world was going to pieces; when the city streets were filled with horse-drawn carriages running by bright-colored posters, you could no longer tell the real from the simulated; when people were listening to shellac 78s and looking at color newspaper supplements, the world had become a kaleidoscope of disassociated imagery; and when the broadcast air was filled with droning black-and-white images of men in suits reading news, all of life had become indistinguishable from your fantasies of it. It was Marx, not Steve Jobs, who said that the character of modern life is that everything falls apart. In the latest issue of French Literature, Eugenio Renzi us of the fact that a significant part of contemporary cinema now written without the tools he needed historical far. The computer has become, simultaneously, the brush, palette and gesture, thus replacing the camera, the frame and the film crew. We could add that the computer is now the accountant's calculator to give an additional perspective to this ubiquity. These new conditions of writing film offer an opportunity to engage the film in the field of non-figuration, thus reproducing an evolutionary scheme known in the paint. If you do not see any a priori objection to the film finds its way to non-figuration, however there are several comments about the fact that scanning is the preferred way to access it. The computer is the tool of cybernetics, both materialization of abstract research conducted as part of the school of mathematical thought which it claims main instrument and waved to concretely explore further the field. Before its wider dissemination as common household appliance, the links between computer and systematic approach to governance arrangements were more explicit. The Macy Foundation conferences, which were developed during the conceptual foundations of cybernetics, clung to unify and universalize models of living (including human behavior, individual and collective) in terms of computability, with perspective as a possible programming in the public interest. Obviously, these determinations are now ideological overall direction of our societies heavily equipped by digital technology, and there is no time to ask the question of their relevance or suitability for a dignified existence. [Google Translation:] Each year, the famous site Edge of 'cultural impresario " John Brockman with "the question of the year." Dozens of intellectuals naming response and the result is fascinating. Freely translated was the question this year: what scientific concept should be widely implemented in society so that we are way better cognitive control over the world get? The underlying idea is that our debate today has many concepts as we experience it, but not always were. Concepts that may influence our world view and the debate about it. Brockman declares himself indebted to James Flynn: "His idea is thats the abstraction is available as a single cognitive chunk Which Can Be Used as an element in thinking and debate." ...Carr believed his constant use of the internet -- distractedly clicking from web page to page, to his email account, to web video, and back again -- was changing the way his brain worked and chipping away at his capacity for concentration and contemplation. Was the internet making him stupid, Carr wondered? "I'd sit down with a book, or a long article," Carr said, "and after a couple of pages my brain wanted to do what it does when I'm online: check email, click on links, do some Googling, hop from page to page." Last year, edge.org, a leading technology website asked scores of philosophers, scientists and scholars whether the internet was changing the way they thought. The answers were varied, but uniform in their response: the web had both profoundly affected the way we gather our thoughts, and how we disseminate the information, they said. In a country where the average teen sends 3,500 text messages a month and spends approximately seven-and- a-half-hours a day on Facebook, Twitter and Instant Messenger, technology-driven chronic distraction is a well- documented problem. Numerous studies have shown that internet- obsessed teenagers are less empathetic than generations past. During her research, Turkle spoke to teenagers who admitted they were too afraid of the unpredictability of a telephone to pick up and make a call. Instead of sitting down to write a note, they preferred to text. Every year since 1998, EDGE, the quintessential arbiter of all things cool and compelling in the world of science and technology, has been asking some of the brightest thinkers and doers across the cultural spectrum to answer one big question about the future of science, technology and society at large. The answers are then published in an annual edition, which serves as a fascinating and illuminating timecapsule of the intelligencia's collective conscience that year. This week marks the release of Is the Internet Changing the Way You Think? : The Net's Impact on Our Minds and Future — the fantastic compendium of responses to last year's question, featuring greats like Chris Anderson, Esther Dyson, Howard Gardner, Kevin Kelly, Brian Eno and 167 more. 1998: What Questions Are You Asking Yourself? 1999: What Is The Most Important Invention In The Past 2000 Years… And Why? 2003: What Are The Pressing Scientific Issues for the Nation and the World, and What Is Your Advice on How I Can Begin to Deal With Them? ...A handful of the annual questions are available in book form, we couldn't recommend them more. The internet has come a long way since Sir Tim Berners-Lee, the inventor of the world wide web, turned on the first web server in Geneva on Christmas day 1990. Today, 2bn people are online; 800m of them are on Facebook. Every minute, 24 hours worth of video is uploaded to YouTube. Google, a company founded only 15 years ago, has a market capitalisation just short of $200bn and a mission statement that it intends "to organise the world's information and make it universally accessible and useful" – something no one thinks unlikely or even remarkable. We now bank, shop, communicate, work and date through the internet. The internet has come of age. It is as defining an achievement for humanity as the Enlightenment or the industrial revolution. ...In his new book, editor and literary agent John Brockman has collected answers from the likes of Richard Dawkins and Brian Eno to a single question originally posed on his website, Edge.org: "Is the internet changing the way you think?" The 164 contributors are as thoughtful as commentators at the web's imminent 21st birthday ought to be. Hope, that cyberutopian hallmark, spreads throughout this book. 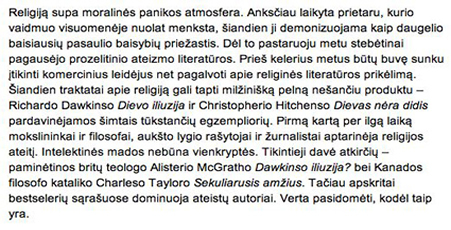 [Google Translation:] ...An interesting assembly of 164 influential intellectuals in the magazine's Annual Question Edge.org, which asks each participant an answer to the same question. Last year the question was "How is the Internet changing the way you think? "; a question was published a few weeks ago where, with regard to the Wikileaks affair, the Edge participants were asked "Who gets to keep secrets?" When I originally came across the new book Is The Internet Changing How You Think? edited by John Brockman, I could not help but chuckle. The title sounds about as ridiculously out of date as Al Gore's famous description of the Internet itself: "The Information Super-Highway." ...Although I enjoyed every one of the essays, it was Brian Eno's "What I Notice" that most made me sit up and (pun intended) take notice. The piece has a rhythmic flow, each thought beginning with the words "I notice…" But he hit upon an amazing piece of truth with this one: "I notice that everything the Net displaces reappears somewhere else in a modified form... Bookstores with staff who know about books, and record stores with staff who know about music are becoming more common." ...I was shocked at how much these bite-sized essays made me think. And yes, I oftentimes read them sitting down. Is The Internet Changing The Way You Think? is the ultimate bathroom book for pseudo-intellectuals like myself. But honestly, there is nothing intellectual about it at all. The collection reads very much like a conversation with a trusted friend. EDGE QUESTION 2011 - WHAT SCIENTIFIC CONCEPT WOULD IMPROVE EVERYBODY'S COGNITIVE TOOLKIT ? Seth Lloyd - The ability to reason clearly in the face of uncertainty. Any citizen who wants to vote responsibly needs to have a sense of proportion and be able to weigh the choices our democratic government is making quickly and easily. Look at the total dollars to be spent and compare it the total number of people who might benefit to get a cost per person. Gerd Gigerenzer - Risk Literacy Statistical thinking is the ability to understand and critically evaluate uncertainties and risks. Yet 76 percent of U.S. adults and 54 percent of Germans do not know how to express a 1 in 1,000 chance as a percentage (0.1%). Schools spend most of their time teaching children the mathematics of certainty — geometry, trigonometry — and spend little if any time on the mathematics of uncertainty. If taught at all, it is mostly in the form of coin and dice problems that tend to bore young students to death. But statistical thinking could be taught as the art of real-world problem solving, i.e. the risks of drinking, AIDS, pregnancy, horseback riding, and other dangerous things. Out of all mathematical disciplines, statistical thinking connects most directly to a teenager's world. HOE VERANDERT INTERNAET JE MANIER VAN DENKEN? HOW DOES THE INTERNET CHANGE THE WAY YOU THINK? [Google Translation:] WHO GETS TO KEEP SECRETS? Following the Wikileaks exposures there is public debate around the question of the worldwide distribution of secrets kept by a few and hidden to the rest of the citizens of the world. Leading intellectuals have surpising answers to the question of whether it is moral and right to kepp secrets from us. [Google Translation:] ...A case in point is the Wikileaks leaks site and Julian Asange, and whether the site helps democracy or terrorism sparked renewed discussion of the issue of secrets and justification exposure. This discussion came to a group of smart people in the world: the intellectual authors of the online magazine Edge.org. Site Edge.org question from time to time publish the same, and directs it to people like the father of behavioral psychology Nobel Prize winner Daniel Kahneman, we present economic crisis and author of "Black Swan" Nassim Taleb, former chairman of the World Web Consortium former Esther Dyson, the inventor of blogging and RSS Dave Winer, and many other writers, philosophers and key figures in the history of the Internet. Sometimes the answers are published as a series of articles, and sometimes, such as this one, in a rabbinical manner, in a fascinating dialogue. This one is a loaded question, presented this time by Dnny Hillis, former Disney executive VP, and cofounder of the large patent firm Applied Minds, is short and to the point: Who is entitled to keep a secret? By extension — when is it allowed to reveal secrets and when is it required to disclose them? How do you know if the exposure is a mitzvah, or betrayal? Google Translation: Internet "Superficial Disease"
[Google Translation] ... For Internet poisoned the brain, the human superficial point of view, network researchers have different views. 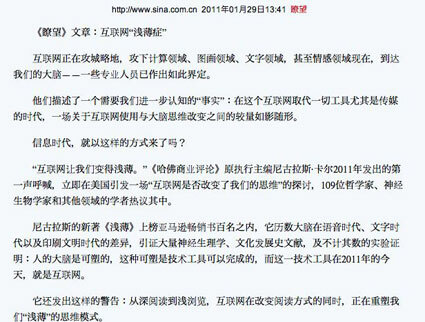 Secretary-General of Chinese Academy of Social Research Center of Information, "Internet Week" honorary editor of Jiang Qiping said the "shallow" is different from the degradation of the cognitive domain, he would understand it to "return to the present time the thing itself." "The Internet in the end of our brain do? The brain in adapting to the Internet, or the Internet to change the brain?" 2010 U.S. edge.org site "annual issue" - "The Internet has changed our minds? "Trigger hot, 109 philosophers, neurobiologists, and scholars in other fields to participate. "The Internet does not change our way of thinking." Harvard University neuroscientist (JoshuaGreene) that the Internet "provides us with unprecedented access to information channels, but did not change (our brain) process information . " "Electronic media will not rebuild the mechanism of the brain to process information." Harvard University cognitive psychologist Steven Pinker (StevenPinker) that message, surfing the Internet, the use of Twitter who have not trained your brain to "parallel multiple channels, the new information. " In the eyes of the curious, the world is an endlessly fascinating place. There is a well-nigh inexhaustible stream of ideas, events and phenomena worth pondering — and profiting from. It is in this spirit that the Edge Foundation does what it does. Every year, Edge.org's World Question Center poses a new question to be answered by a group of luminary thinkers — philosophers, scientists, historians and the like. As one might expect, the utility of the answers hinges on the quality of the inquiry. Some years the question is too sanctimonious or navel-gazing to be of much use. "What scientific concept would improve everybody's cognitive toolkit?" "Is the Internet Changing the Way You Think? : The Net's Impact on Our Minds and Future" (Harper Perennial, $14.99), edited by John Brockman: If you're interested in answers from 127 experts (count 'em!) to the question in the title of this book, it's a volume that will keep you busy for a while.